You know Roomba, that robot vacuum cleaner you keep seeing at Wal-Mart? It scares the crap out of us. Because if there's one thing sci-fi has taught us, it's that any intelligent device or creature we create and force into servitude will someday come to life and enslave us. The latest evidence of this? Enchanted Arms, a niche-y role-playing game that takes place in a world filled with man-made beings called "golems." They come in a zillion shapes and sizes, but every last one has decided - you guessed it - that the human race would be much easier to care for if we were all dead. It's up to you, as an average (yet, of course supernaturally gifted) student at Magically Kicking the Crap Out of Stuff University and your variously talented friends to fix it all by bashing the golems' rebellious teeth in - and if they don't have teeth, by just pounding your wrath into whatever body part is closest to you. Battles are the meat and potatoes of Enchanted Arms. The two opposing forces are plopped onto two connected 4x3 checkerboard-like grids and take turns casting, bashing, and blasting the stuffing out of one another. It's not quite as simple as rock 'em, sock 'em, though. Various elements are stronger against certain foes, and different attacks have different shapes - a spear stab strikes forward for three squares, but a magical tidal storm might strike in an X-shaped pattern, and a gatling gun blast could perforate an entire nine-square area. Characters can also help shield one another, so maneuvering is critical as well. The question is this: what were some of these crazy golems originally used for? 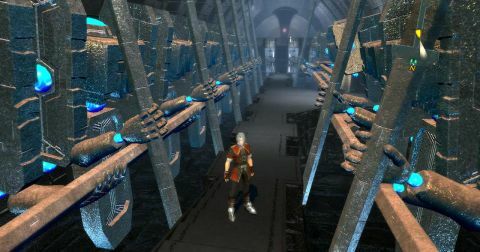 There are more than 125 in the PS3 Enchanted Arms (up from around 100 in the 360 version), and they run the full gamut. Within the first two hours, we encountered a giant stone knight, a hyper-cute pink-haired maid (with giant gun), a green salamander kinda thing, and a flat dude with a pizza for a head. More importantly, we not only met them, we collected them. Sort of. You see, golems you've defeated can often be reconstituted to fight for you. In fact, recruiting them to your army is a huge part of the game. Thus, Enchanted Arms materializes as a sort of Pokemon in Final Fantasy clothes. It doesn't look mind-blowingly next-gen, but it's artistically gorgeous, full of elaborate spell effects and lavish environments that aren't nearly as wide-open as they first appear. And there's a ton of the usual RPG linear exploring, talking heads, looking for items, and random battling. Description Classic-style Japanese role-playing game served up with over 75 creatures to use however you choose.